Limited quantity of 225 Available! The Freedom E310 (FE310) is the first member of the Freedom Everywhere family of customizable SoCs. 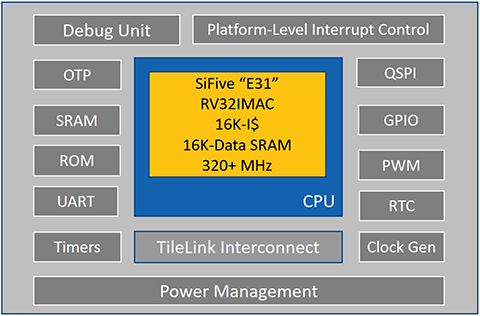 Designed for microcontroller, embedded, IoT, and wearable applications, the FE310 features SiFive’s E31 RISC-V Core, a high-performance, 32-bit RV32IMAC core. Running at 320+ MHz, the FE310 is among the fastest microcontrollers in the market. Additional features include a 16KB L1 Instruction Cache, a 16KB Data SRAM Scratchpad, hardware multiply/divide, a debug module, one-time programmable non-volatile memory (OTP), flexible clock generation with on-chip oscillators and PLLs, and a wide variety of peripherals including UARTs, QSPI, PWMs, and timers. Multiple power domains and a low-power standby mode ensure a wide variety of applications can benefit from the FE310. I have just created the GroupGet for Freedom E310 - FE310 MCU (Round 3)!